There were 700 of us and 30 of them, but the anarchist youths who came to Sunday’s peace vigil in Asheville succeeded in disrupting the vigil with violent chants, air horns and drums. 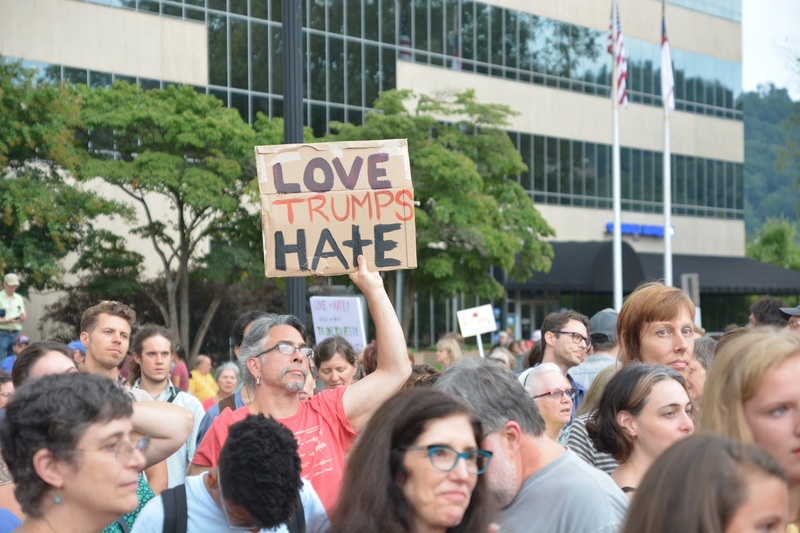 We held a peace vigil in Asheville on Sunday and about 700 people came out to denounce racism and violence and to remember and honor the three who died in Charlottesville, Va.
As we were about to start, a rowdy group of about 30 young people came running onto the scene carrying banners. Most of them weren’t old enough to vote and most of them were dressed in black. All of them were white. Some covered their faces with bandannas. When we started speaking, they started blowing air horns, drumming and chanting violent slogans. They told us they were Antifa, short for anti-fascists. They’re also anarchists. They came to disrupt and they did. Unfortunately, the amplifier we have used for rallies for eight years died on us, so we had to try to speak over their noise. They wanted their voices heard and they were intent on blocking anyone who disagreed with them. A number of us tried to talk to them one-on-one, and what they want is chaos. That was their answer. They want to “tear it down!” They want to kill all police. They want government gone because our current government is corrupt. I allowed them to speak as long as they didn’t promote violence. One of them came up and grabbed the microphone, which was sitting on the ground. She thought she was going to take over the vigil. I offered her the “stage,” a 2-foot wall at the front of the space near the Vance Monument, and she spoke about how she thought all white allies were racist because they have no idea what black people want (she was white). When I talked to one young man about my commitment to nonviolence, he called me a coward. I thanked him for talking to me and walked away. They appropriated other people’s belongings (including my umbrella) to hold up their signs and then called us names when we wanted our things back because we were leaving. One young man accused me of assaulting the woman who had my umbrella when I took it from her. But it was fine for them to assault a news reporter who came to cover the vigil. I don’t think I’ve ever encountered a ruder, more inconsiderate group of people, or people who are so fully unaware of their own privilege. We welcomed them when they arrived, we were happy to have them participate, but they didn’t come to participate, they came to disrupt. Several people I knew who came for a peaceful demonstration left. Others tried to talk to them but came away with the impression that they only want their views to be heard and no one else’s thoughts mattered. The group that pulled down a Confederate statue in Durham the next night also identified as Antifa. They at least were a diverse group and from what I hear, they weren’t chanting, “Kill the cops.” So, while I’m happy to see the glorification of a system that owned human beings shut down, I’m not happy to see the kind outburst I saw on Sunday from a group of people who are doing all they can to promote violence for their own glorification. These young people — most of whom were not old enough to vote — think violence and chaos is the solution to the world’s problems, as though they have the experience or the wisdom to solve the complex problems we face as a nation and as a planet. Our government is corrupt as hell. Our entire economic system is a nightmare for most of the population right now. But to tear it all down and say we should each fend for ourselves is not a solution. But there was no reasoning with the members of this group. I tried to speak to several of them and not one wanted to hear what I had to say. They shouted me down, calling me cowardly, racist and homophobic. Yes, I’m white. So are they. There was not a person of color among them. I’d be OK with that if they weren’t calling me and others these hateful things as though they were the only ones who could be allies against the system. The Vance Monument, which towered over us, is a tribute to a slave-owning former governor. The ground on which we stood still carries the shame of having been a slave market. I suggested we could consecrate this ground and rededicate it to justice and equality. The crowd applauded, and the Antifa folks chanted, “Tear it down!” But they weren’t talking about just the monument, they were talking about everything — all of it. We held our vigil in spite of them. We will do the same if they show up again. Only next time, we will have an amplifier, and we will spread our message of peace. I was so disheartened by what happened on Sunday, as were my fellow organizers. I want everyone to have a seat at the table, but I can not ally myself with people whose only aim is the violent overthrow of everything, and the members of this group who I spoke to on Sunday advocated nothing more than violence. Violence begets violence. Hate begets hate. Love trumps hate. Yeah, that was another one of our chants.